If we looked at a Venn Diagram of people who love chicken wings vs. people who make chicken wings at home for themselves, there wouldn’t be a lot of overlap. I’m here to fix that with a fool-proof recipe packed with rich, umami flavor that will help restore belief in your chicken-making abilities. Fall is here, and for me and other amateur gourmands this means invoking the spirit of Ina Garten, queen of bougie comfort food. Summer in a bowl. People, I now present to you delicious ataulfo mango with avocado, tajín, and queso freso. Enjoy! Eat em with steak, eat em with fish, eat em with forks, or chopsticks, or nothing at all. These cold and refreshing ramen noodles are gonna be your go-to side dish all summer. When you strain the noodles, reserve a little water and place them in a bowl to be refrigerated. In a large bowl, whisk together the sesame oil, mirin, soy sauce, shallots, garlic, honey, sesame seeds, and the ginger. cover and refrigerate immediately. After about 30 minutes or when the noodles and vinaigrette are cold, carefully toss the noodles in the dressing. Serve with sliced scallions and sesame seeds. I'm here for the beer. Batter, that is. Once I learned how easy it was to beer batter and fry just about anything, I never looked back. Fried squash rings are the hottest side dish in NYC right now, and I'm not mad about it. Dinner doesn't always have to be meat, veggie grain, sometimes it can be a bunch of good stuff thrown together in a skillet and that's totally OK. It's not lazy to want all of your food cooked in the same pan, and if anything it makes for a harmony of flavors with easier cleanup. Going dairy free for the month of January meant getting creative, and it's challenged me to come up with recipes that'll make me feel full without shaving 1/2 a pound of cheese over everything. Getting my fat from other sources like avocados, coconut milk, and cooking oils is a nice change from the ordinary cream sauces and wintery-baked dishes. If you've ever had fried cabbage, this skillet kind of invokes the same feeling of nostalgia. 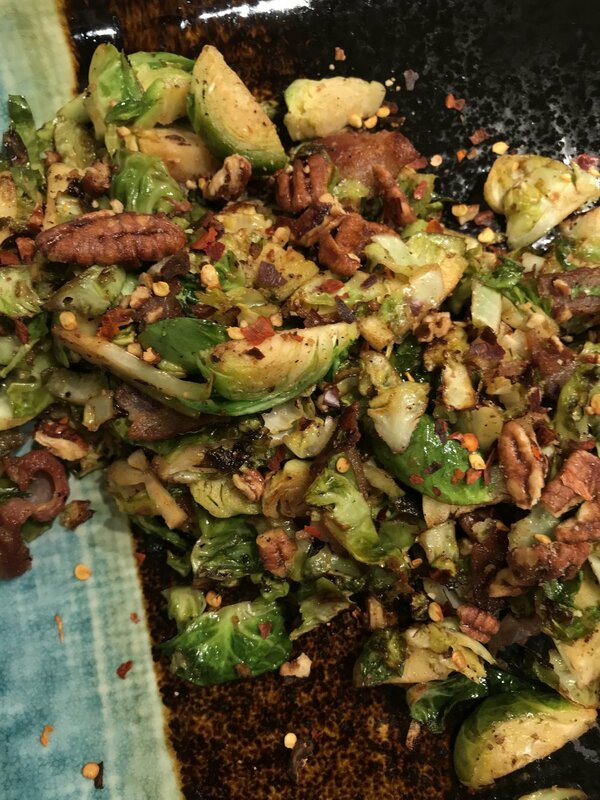 It's got bacon and red chili flakes which my mama usually adds to her fried cabbage, but I've added paprika and candied pecans for sweetness, and garlic and dijon for a savory spiciness. You can easily throw this skillet together in under 15 minutes and eat it on its own, but it works great as a side dish accompanying some grilled chicken breast, steak or even salmon. I hope you enjoy it like I did. In the skillet that you'll cook everything else in, fry the bacon strips on medium-high until they're cooked but not completely crispy, then set them aside on a paper towel. 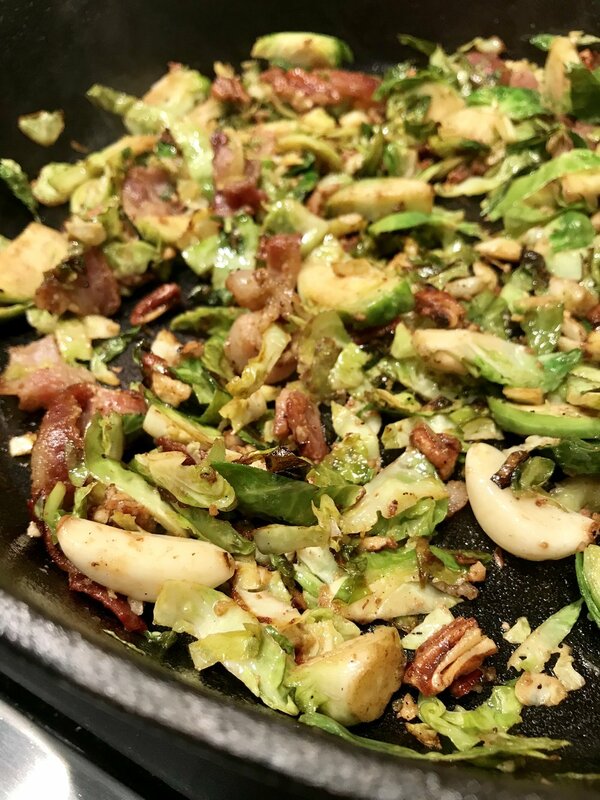 With the skillet still on medium-high, toss the sprouts in the oil, along with the dijon, garlic, paprika, and salt. Cook for another 7-10 minutes, splashing the skillet with apple cider or other vinegar if the pan gets sticky. Top with crushed candied pecans and red chili flakes then serve. This macaroni and cheese recipe is special, and not just because there's caramelized onion and slow-roasted butternut squash in here. It's baked in cute little paper cups, so everybody gets a corner piece. Maybe you ended up here because you've got a head of stinky cauliflower in your fridge and you have no idea what to do with it. Either way, this is a judgement-free zone, and I welcome you with open arms. ou can throw all of this together in less than 15 minutes, roast it and have some protein going on the stove top at the same time, and that's dinner in under an hour. 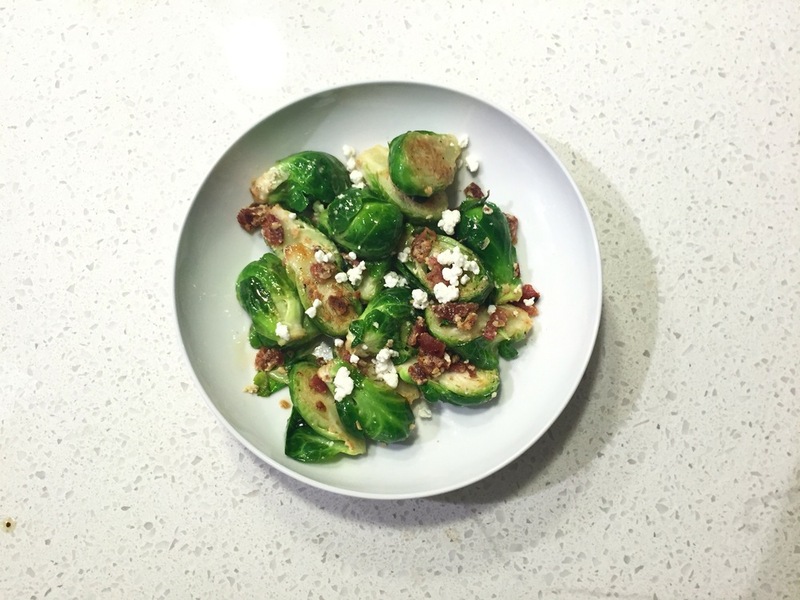 Sweet and sticky charred Brussels sprouts with salty and crispy chorizo blanketed in spicy and tangy gochujang. Nuff said. These grilled and stuffed peppers are easy but impressive. There are only 4 ingredients inside but they've got flavor for days. People say don't mess with a classic...but does it really count as messing if there's lobster involved? With this recipe I'm serving up a bite-sized version of surf and turf: Thai-inspired meatballs and coconut fried shrimp (licks lips). Coconut Milk Braised Collard Greens with Bacon! This right here is my twist on a classic Southern dish. You get smoky and sweet from the sugar-cured bacon, spice from the paprika and cayenne, and richness from the coconut milk. Y'all asked for it, so here it is. Naughty Brussels sprouts came about when I had a hankering for these crunchy mini cabbages but also wanted to accompany them with all the fixins. Yes, alladem. What makes them so delicious might be the bacon grease you cook them in, but it might also be the goat cheese. Or the honey. That's for you to decide. Tell me how they turn out! 1. 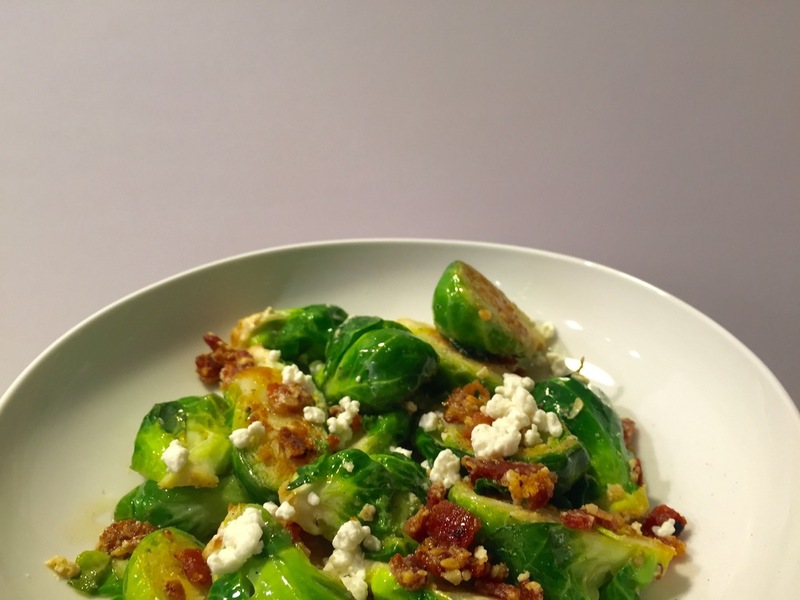 Chop the Brussels sprouts! Fresh is best, frozen may end up being soggy. 2. Cook the two pieces of bacon until they're on the verge of crispiness, leave the grease in the pan. 3. 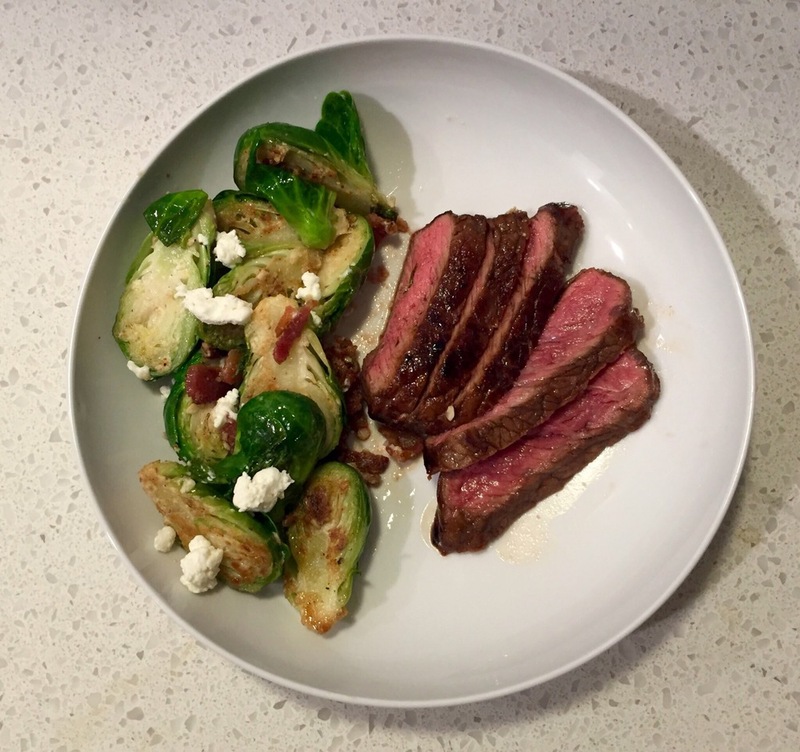 On medium high, saute the sprouts. Get them well-coated with oil and make sure the insides look golden. If the grease starts to pop, turn the heat down. 4. In the serving dish, add the chopped bacon, sprinkle with the goat cheese, and finally...drizzle with some of that honey. Serve how you'd like. It's just that easy. And so so good. 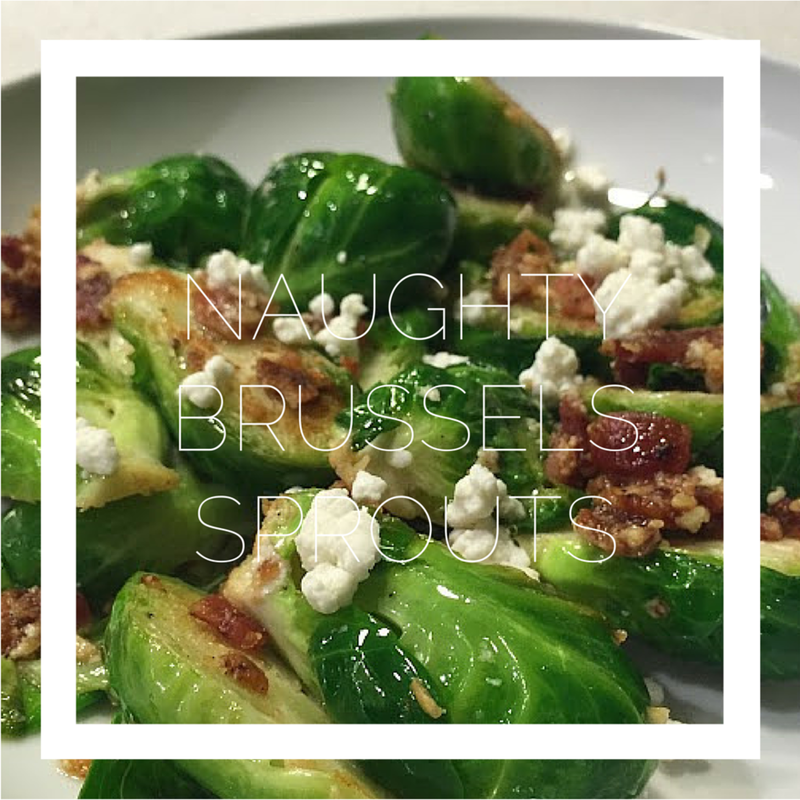 Dress em up for once, you'd be amazed how delicious Brussels sprouts can be!